ANAHEIM, CA	- 16 Oct 2006: Information on Demand Global Conference -- IBM (NYSE: IBM) today introduced IBM Information Server, a first-of-a-kind software platform that enables clients to deliver trusted, consistent and reusable information to applications and business processes. Unveiled at IBM's inaugural Information on Demand Global Conference, IBM Information Server combines technologies developed in the company's 55 global software development labs, software from key acquisitions, including Ascential, Venetica, Unicorn and CrossAccess, and more than 20 years of IBM information integration expertise. IBM expects IBM Information Server to be a catalyst for its cross-company Information on Demand initiative and accelerate its drive to capture an emerging growth opportunity, estimated to reach $69 billion by 2009 (18% CAGR). The advent of IBM Information Server is an important milestone in IBM's efforts to enable organizations to use information as a strategic business asset. It is the first unified software platform able to deliver all of the functions required to integrate, enrich and deliver trusted information for key business initiatives. IBM Information Server helps organizations derive more value from the complex, heterogeneous information spread across their systems by enabling them to understand their disparate data sources; cleanse data to ensure consistent quality; transform and restructure information for the intended use; and deliver data in the form needed. "Every aspect of a business depends heavily on information, yet most organizations lack access to information they can really trust to be complete, accurate and properly interpreted," said Ambuj Goyal, general manager, IBM Information Management, IBM Software Group. "IBM Information Server is a new kind of platform, built from experience with more than 5,000 customers, that allows organizations to turn complex, heterogeneous data into trusted information to drive new innovation, increase operational efficiency and lower risk." Key business initiatives such as creating a single view of the customer, business intelligence and compliance require complete, accurate and up-to-date information. However, organizations often have hundreds of disconnected systems deployed at different times by different people, making it a challenge to find important information when needed, verify content, and understand how to interpret data. For example, a manufacturer could use IBM Information Server to integrate data from across its various subsidiaries, retail outlets and trading partners. With IBM Information Server, the manufacturer can combine sales figures with real-time inventory data from various sources, standardize and merge customer data, and deliver consistent information to operational data stores, data warehouses or master data applications. IBM Information Server also was designed to be an essential foundation for Service Oriented Architectures (SOA), providing consistent, reusable information services, improving business flexibility and speeding time to market for new applications. It has been through two extensive beta programs involving more than 75 clients and partners. Experience from beta testing has allowed IBM to refine the high levels of productivity and scalability the platform affords. "As America's most convenient bank, Commerce Bank relies on timely and accurate information from all of its systems as we provide world-class support to our customers," said Thomas Huslin, manager data architecture, Commerce Bank. "We have experienced firsthand how the new IBM Information Server's capabilities for understanding, cleansing, transforming, and delivering information are enabling us to respond to market opportunities, and stay ahead of the ever-increasing demands for efficient reporting and compliance." Demonstrating early industry support and interest in IBM Information Server's ability to unlock information from repositories, processes and application silos, more than 30 partners today announced plans to integrate with IBM Information Server, extending their products and services around the new platform, including: Adastra Corporation, Alpine Consulting, Inc., Applix, Inc., Attensity, Attunity, Ltd., Capgemini, Cognos, Cyrulean, Data Modelling Consultoria, DataDirect Technologies, DATAllegro, DataSkill, Inc., DOT Group, Ltd., Exeros, Inc., GoldenGate Software, Hitachi, Hyperion, Integrated Technology, Intel Corporation, Intelligent Communications AS, iWay Software, Jinfonet Software, Kazer Corporation, MD2 Consultoria e Negócios, MicroStrategy, Mindreef, Inc., Netezza, Platon Data Technology, Novabase do Brasil, Strategies2Integrate, Sun Microsystems, Tata Consultancy Services, Teradata, a division of NCR and Unycorp. IBM Global Technology Services and IBM Global Business Services plan to offer professional services to support IBM Information Server. The services will be designed to ensure that businesses have a proven IT architecture and can adopt new business solutions without fear of overburdening systems or losing investments in current assets. The availability of IBM Information Server is also creating opportunities to leverage new technologies such as grid computing to accelerate the processing of enterprise information and enable better decision-making in data intensive computing environments. IBM plans to offer IBM Information Server Blade solution next year to enable organizations to quickly build an information grid that can scale to meet the growing demand for trusted information. IBM Information Server also leverages IBM Industry Models for Banking, Retail, Telecommunications and Insurance that provide business modelling through data, process and services templates and business-ready blueprints proven with more than 400 customers. 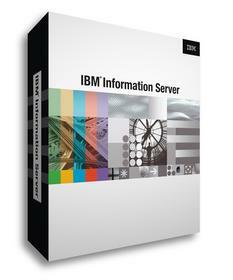 IBM Information Server will be available worldwide through IBM and IBM Business Partners in November 2006. IBM and the IBM e-business logo are trademarks or registered trademarks of International Business Machines Corporation.